Jackie Evancho, O Mio Babbino Caro, O My Dear Husband. Opera. Woh Jo Hum Mein, that longing there was within us. French, n’oublie pas. Wohi Yaani Waada Nibaah Kaa, Tumhe Yaad Ho Ke Naa Yaad Ho. The longing that was present between you and I, perhaps you have forgotten and then perhaps not. Le désir qui était présent entre vous et moi , peut-être que vous avez oublié , puis peut-être pas. Those new injuries and complaints came with uplifting stories as well. Ces blessures et les plaintes sont venus avec des histoires édifiantes ainsi. Some time ago, there was yearning between us, some time ago there was a path to us. Il ya quelque temps, il y avait la nostalgie entre nous, il ya quelque temps il y avait un chemin pour nous. That you mocked were useless, and now count among love. I am that poet Momin that you remember or will not. Que vous moqué étaient inutiles, et maintenant compter parmi amour. Je suis ce poète Momin que vous rappeler ou ne sera pas. This blog can no longer provide service to the human race. Come back after we are moralized. Till then, best of fortunes. Is There A Higher Law ? According to MK Gandhi only when the Creator permits it. It is realized as Moral Law. We constantly pronounce judgments upon the value of actions. Some actions satisfy us and others do not. Whether a certain act is good or bad does not depend upon whether it is beneficial or harmful to us. In judging it, we adopt quite a different standard. We have in our minds certain ideas and on the basis of those we judge the acts of others. Whether any wrong done by one to another affects us or not, we do feel it to be wrong. Sometimes, we have a sympathy for the wrong-doer; but despite that sympathy, we feel no hesitation at all in pronouncing his act to be wrong. It may be that at times our judgment is found to be mistaken. We cannot always fathom a man’s motives, and may thus judge him wrongly. Nevertheless, we find no difficulty in judging an act in so far as the intention is known. Even if our personal interests are sometimes served by wrong actions, we do feel inwardly that they are wrong. Thus it is established that the rightness or wrongness of an acts does not depend upon a man’s self-interest. Nor does it depends upon his wishes. There is a difference between morality and sympathy. Out of sympathy for the child we wish to give it a certain thing, but if the thing is harmful to the child, we hold it immoral to give it. It is doubtless good to show sympathy but, unrestricted by moral considerations, in turns into poison. We see also that moral laws are immutable. Opinions change, but not morality. When our eyes are open, we see the sun; when they are closed, it is not seen. The change here has been in our sense of sight, not in the fact of the sun’s existence. The same hold true of moral laws. It is probable that in a state of ignorance we do not know what is moral; but once the eye of knowledge is opened, there is no difficulty in knowing it. Men rarely care to see single-mindedly the right or wrong of things; often prompted by personal considerations, they mistakenly describe the immoral as moral. The time is yet to come when men, freeing themselves from self-regarding considerations, will concentrate their attention on the ideas of morality alone. Moral culture is still in its mere infancy; it is as science was before the birth of a Bacon or a Darwin. Men were eager to know what the truth was. Instead of inquiring into morality, they have been hitherto engaged in discovering laws of nature -the laws of the earth’s motion, etc. Where do we find the disinterested students of morality, patient and painstaking, who, setting aside his earlier superstitious notions, devotes his life to seeking only the ideal good? When men become as eager to explore the world of moral ideas as they are now to explore the realms of nature, we shall be able to bring together the various conceptions of morality. It is unlikely that, on ideas of morality, there will be the same divergence of opinion as exists among men on matters of science. However, we may not for a time arrive at unanimity of opinion regarding moral laws. This does not, however, mean that it is impossible to distinguish between right and wrong. We thus see that, independent of and apart from men’s wishes and opinions, there is something like a moral standard which we may call moral law. If there are laws of the State, why may not there be a moral law too? It does not matter if that law is not committed to writing by man, and indeed it need not be. If we grant or hold that the moral law exists, it is incumbent on us to obey it, just as we ought to obey the laws of business and remain poor? Or if I disobey the laws of the State and incur the ruler’s displeasure?” But it will never do-either for me or anyone else-to say, “What does it matter whether I tell a lie or tell the truth?” There is thus a great difference between moral laws and temporal laws. For morality dwells in our hearts. Even a man practicing immorality would admit that he has been immoral. A wrong can never become a right. Even where a people is vile, though men may not observe the moral law, they would make a pretence of doing so; they thus are obliged to admit that moral laws ought to be observed. Such is the greatness of morality. It cares not custom nor for public opinion. To a moral man, public opinion or custom is binding only so long as it is in harmony with the moral law. Where does this moral law come from? This law is not laid down by the State, for different laws are found in different States. Many men were opposed to the morality which Socrates observed in his day. Even so the world admits that the morality he observed has remained, and shall remain, morality for ever. Robert Browning says, ‘If ever Satan proclaimed the law of hatred and untruth in the world, even then justice, goodness and truth will continue to be divine.’ (…justice, good, and truth were still Divine, if, by some demon’s will, Hatred and wrong had been proclaimed Law through the worlds, and right misnamed. Christmas Eve, XVII.) One may conclude from this that the moral law is supreme and divine. Such a law no people or individual can violate to the end of time. As has been said, even as the dangerous storm ultimately passes, immoral men must meet their destruction. (As the whirlwind passeth, so is the wicked no more; but the righteous is an everlasting foundation. Proverbs, X. 25.) No sooner did the cup of sin in Assyria and Babylon become full than it broke. When Rome trod the path of immorality, none of her great men could save her. The ancient Greeks were an accomplished people, still all their art and philosophy could not continue in their immorality for long. The French Revolution was but and insurrection against immorality. The same was the case with America. The good Wendell Phillips used to say that immorality even if enthroned will not endure. This mysterious moral law brings prosperity to the man who observes it: it sustains the family that obey it, and the community which lives by it ever flourishes. Freedom, peace and happiness are the lot of the nation that lets itself be ruled by this highest law. The truth about civilization, it is a product of wills. 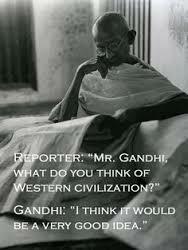 Reporter: Mr. Gandhi what do you think of Western Civilization? Gandhi: I think it would be a very good idea. I do believe that where there is only a choice between cowardice and violence I would advise violence. I advocate training in arms for those who believe in the method of violence. I would rather have India resort to arms in order to defend her honor than that she should in a cowardly manner become or remain a helpless witness to her own dishonor. But I believe that nonviolence is infinitely superior to violence, forgiveness is more manly than punishment, forgiveness adorns a soldier. But abstinence is forgiveness only when there is the power to punish, it is meaningless when it pretends to proceed from a helpless creature. A mouse hardly forgives cat when it allows itself to be torn to pieces by her. … I do not believe myself to be a helpless creature. Only I want to use India’s and my strength for better purpose. Let me not be misunderstood. Strength does not come from physical capacity. It comes from an indomitable will. It is beyond my power to induce in you a belief in God. There are certain things which are self proved and certain which are not proved at all. The existence of God is like a geometrical axiom. It may be beyond our heart grasp. I shall not talk of an intellectual grasp. Intellectual attempts are more or less failures, as a rational explanation cannot give you the faith in a living God. For it is a thing beyond the grasp of reason. It transcends reason. There are numerous phenomena from which you can reason out the existence of God, but I shall not insult your intelligence by offering you a rational explanation of that type. I would have you brush aside all rational explanations and begin with a simple childlike faith in God. If I exist, God exists. With me it is a necessity of my being as it is with millions. They may not be able to talk about it, but from their life you can see that it is a part of their life. I am only asking you to restore the belief that has been undermined. In order to do so, you have to unlearn a lot of literature that dazzles your intelligence and throws you off your feet. Start with the faith which is also a token of humility and an admission that we know nothing, that we are less than atoms in this universe. We are less than atoms, I say, because the atom obeys the law of its being, whereas we in the insolence of our ignorance deny the law of nature. But I have no argument to address to those who have no faith. War and the movement against it. 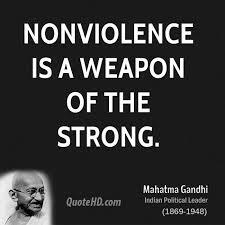 Non-violence is the greatest force. Will America, England and the other great nations of the West continue to exploit the so-called weaker or uncivilized races and hope to attain peace for the world? Not till the spirit is changed can the form be altered. The form is merely an expression of the of the spirit within. My Fair Lady, “Come on Dover, move your bloomin arse!! Audrey Hepburn, Rex Harrison et al.